As the mobile phone evolved from basic voice communication device to a multifaceted lifestyle accessory, making payments has become a key element within that evolution. The mobile device, be it a smartphone or featurephone, can now be used to make payments -- either remotely or at the Point of Sale (PoS). 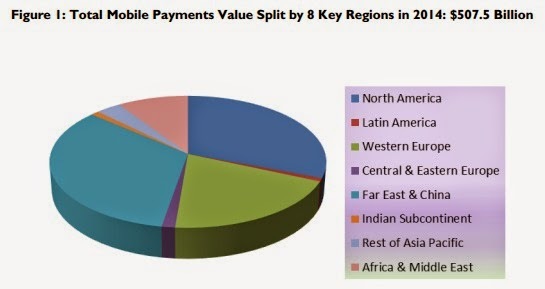 The value of global payments via mobile devices will reach around $507 billion this year -- that's an increase of nearly 40 percent year-on-year, according to the latest market study by Juniper Research. The Juniper study found that growth would continue to be driven by purchases of physical goods via mobile devices. Moreover, average transaction sizes over media tablets are already exceeding those via desktop PCs in many markets. It also observed that while spend via smartphones was increasing sharply, their primary function in retail was as search and discovery devices -- with the final purchase more typically being made via a tablet. Meanwhile, Juniper argued that the scale of digital transactions was receiving a significant boost through the adoption of mobile ticketing applications, with metro and transit authorities in Europe and North America -- that have already deployed services -- experiencing high levels of adoption. However, the study findings also observed that progress in contactless mobile payments had unfortunately been very slow, with few commercial launches. Nevertheless, the prognosis for the medium term is brighter, following the emergence of cloud-based SE (Secure Element) solutions which offer the opportunity for reduced time-to-market for NFC (Near Field Communications) solutions. "The prevalent business models for NFC have been unattractive to banks and left them dependent on multiple network operators, each of which may have its own approach to mobile wallet management," said Dr. Windsor Holden, research director at Juniper Research. He added, HCE (Host Card Emulation) solutions have the potential to revitalize a market which has struggled to gain traction. The opportunity for contactless mobile payments has been bolstered by contactless infrastructure deployments, with the majority of POS (Point of Sale) terminals now shipping with contactless. In a number of emerging markets such as Kenya and Uganda, the imposition of service taxes threaten the buoyancy of domestic mobile money transfer.